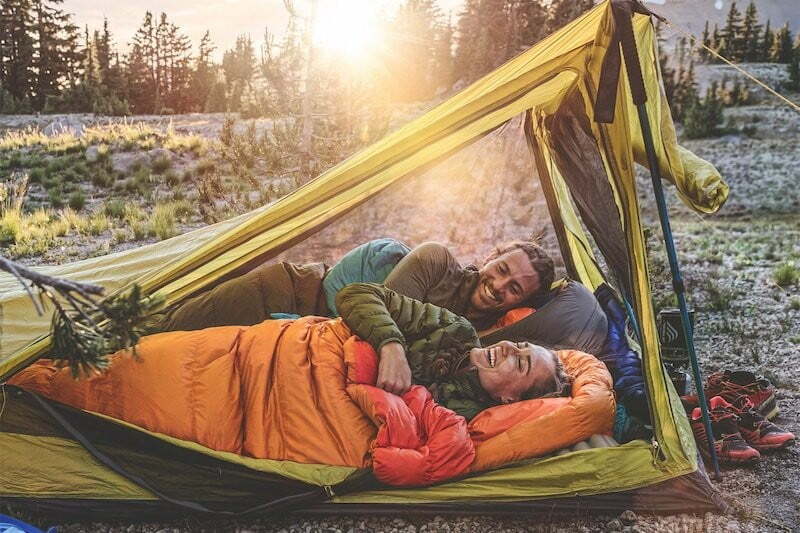 Zenbivy builds on a revolutionary design with its zipperless, hooded quilt. I took one of its latest prototypes, the Zenbivy Light, high in the Rocky Mountains for this review. A stream flowed noisily outside my tent as starlight filtered through the mosquito mesh of my Nemo Hornet tent. The jagged Gore Range stood in stark relief to the starlit sky, a black knife’s edge hovering over the reflection of a mountain lake. I winked my eyes shut, blessed to be in such a serene location many miles from the nearest road. I rolled over and got cozy. Then it dawned on me. In short: Thanks to the clever design of the Zenbivy Light, side sleepers will no longer battle a mummy bag for position supremacy. It feels more like sleeping under a quilt, with the added benefit of a built-in hood and sleeping pad holder. The big difference in the new model is it’s about 8 ounces lighter and compresses about 20 percent smaller, down to about 4 liters. It does this by using 20-denier nylon, a much lighter face fabric material than the 50-denier pongee fabric in the original Zenbivy. Read on for details in the Zenbivy Light Bed. Zenbivy introduced its first sleep system in 2017. 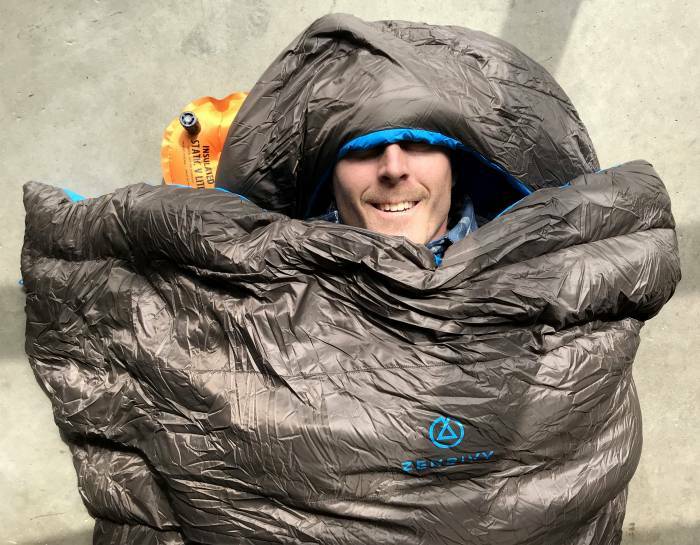 The brainchild of veteran gear designer Michael Glavin (formerly of Sierra Designs), the Zenbivy is essentially a quilt attached to a sleeping pad sleeve. But it takes things a few steps further. A hood is attached to the head-side of the sleeve, giving a nice bit of warmth for your head. And the quilt actually snugs shut around your feet with a bungee cord pull. Loosen the cord, and you can stick your feet out of the quilt to cool off. You can also unclip the quilt from the sleeve to give yourself a place to hang an arm or leg out to cool off. I loaded a prototype Zenbivy Light into my backpack and headed into the Eagles Nest Wilderness in Colorado. My destination: A small lake 11 miles from the trailhead. The author gets cozy on the office floor. I first noticed the very light weight on the 25-degree sleep system. The Zenbivy Light weighs in at 1 pound 13 ounces. For a 25-degree system, that’s light indeed. But would it keep me warm? In a word, yes. Testing the system down to about 35 degrees, I was very toasty in just a light base layer. The Zenbivy Light insulates with 800-fill hydrophobic down, a high-end insulator that is prized for its weight-to-warmth ratio. I expect it would be good down to its rated 20 degrees if you wear a base layer, socks, and a hat. Beyond warmth, I loved the design. It allowed me to sprawl around on my sleeping pad and roll from side to side without squirming inside a sleeping bag. For those who sleep on their sides, it really is a good solution. I only spent two nights in it. My sole complaint was that the sleeping pad sleeve ought to be fitted to your pad. My pad was a few inches too long, so it stuck out the foot end of the Zenbivy. It didn’t make a bit of difference in my sleep, but I can see how an incorrectly fitting pad could be annoying over time. For reference, Zenbivy provides a fitting guide for sleeping pads. For those looking for other option, you can also purchase a quilt alone in 25- or 10-degree models ($200 and $250, respectively). The brand also makes a pillow ($35). Get the whole bundle starting at $320 for the 25-degree and $390 for the 10-degree system. Long versions are a little more expensive. Check out Zenbivy’s Indiegogo campaign for more details. Overall, I really liked the Zenbivy Light. The versatility of the shape coupled with a useful hood and plenty of ways to move give this zipperless design are definite pluses.